My Journey with Parkinson’s … A Natural Approach: Post 161 … Conscious Presence! Based on repeated experience, I’ve decided, actually, more like conclusively concluded, that the best way to combat fear is to live in the present moment … also called living in conscious presence. Actually, let me rephrase this proclamation slightly. I don’t really like the word “combat.” It implies conflict. Resistance. Let’s change it to “dissolve” fear. The reason for this conclusion, is that, again based on my experience, whenever I’m engaged in thought, I invariably end up in a thought that puts me in a state of stress or fear, which in turn causes my symptoms to intensify. The only comforting thing about this is that happens to everyone. Spiritual catalyst, Teal Swan, refers to it as ego coming in the back door. This morning, I experienced this phenomenon firsthand. My Journey with Parkinson’s … A Natural Approach: Post 115 … Our spiritual journey always supersedes the physical! I love epiphanies! Insights! They’re like opening presents under the Christmas tree! Makes you feel like a wide-eyed kid! I had an epiphany this morning. Our spiritual journeys always supersede the physical. The impetus for this epiphany, was my ponderance over why I experienced an improvement in my symptoms this past summer and a worsening this fall. I kind of knew the answer [that I had more to learn], but wasn’t 100% certain. And so I walked up to the labyrinth near my house with this question in mind. My Journey with Parkinson’s … A Natural Approach: Post 102 … The Ultimate Challenge! Living in the present moment, according to Buddhist teaching, is the key to experiencing peace, love and joy! However, living in the present moment when experiencing the collective of symptoms the medical establishment defines as Parkinson’s is a significant challenge. It is the ultimate challenge of acceptance. Why? Because living in the present moment brings me face to face with these symptoms pretty much every moment I’m awake. I was inspired to write this blog by a dear friend. 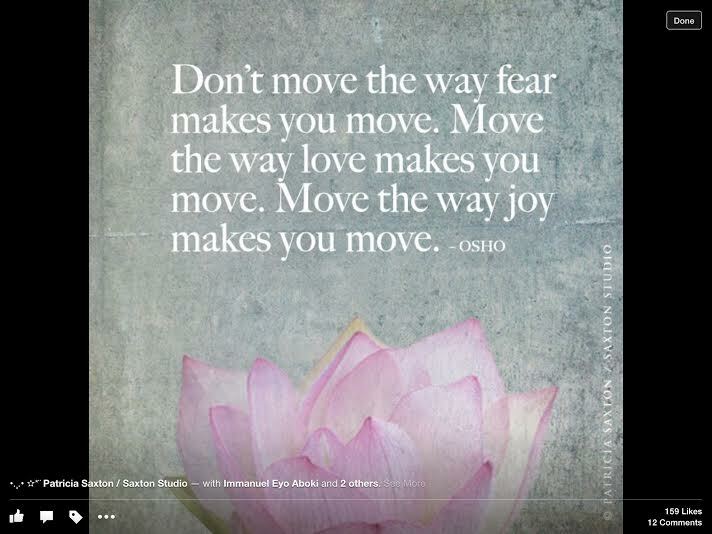 She sent me an e-mail with the Osho quote you see pictured above. It is an important reminder that whatever we are motivated by will usually find us. It’s like the person who leaves the city for fear of being a victim of a crime, rather than moving to the country for the pure joy of country living, only to be mugged in the country.